Individual under-the-desk workstations are an integral part of modern society. Normally a work PC is either thought-limited or throughput-limited, but depending on the type of business and financials of that business, something in the middle might be required. 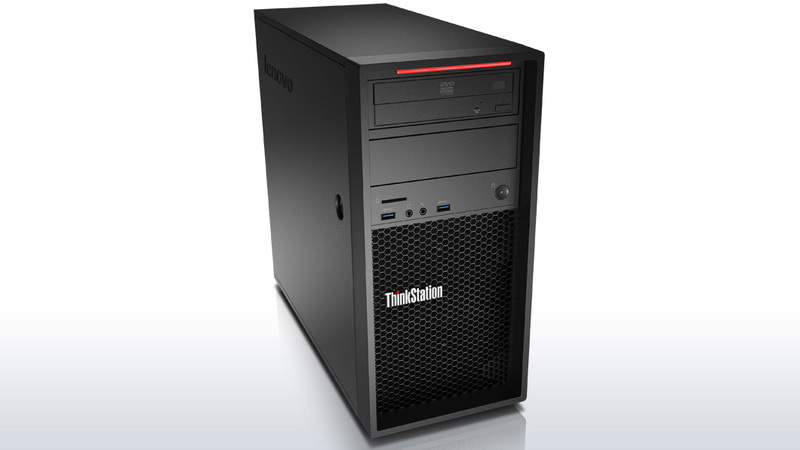 Lenovo’s ThinkStation P300 is set up for that intersection, featuring a quad core Haswell Xeon, ECC memory and a Quadro K4000 under the hood. 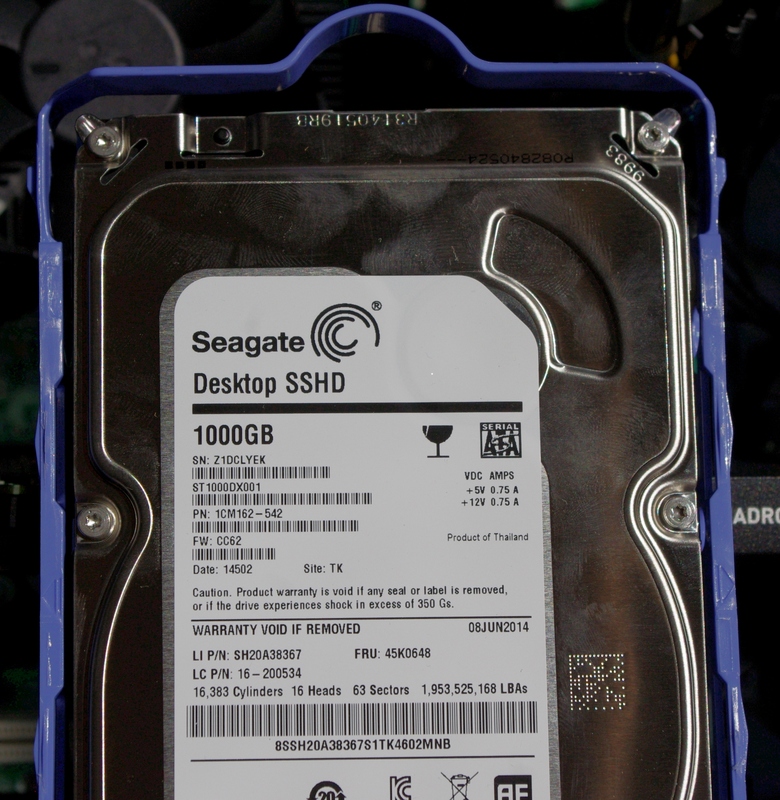 Our sample came with a downgrade to Windows 7, 8GB of DRAM and a 1TB 7200RPM SSHD drive for just over $2100. The ThinkStation P-series comes in four sections: the P300 line with Haswell based Xeons and up to dual channel memory, the P500 line with Haswell-E Xeons and quad channel memory then the P700 which will offer a dual Haswell-E solution when it becomes available later this year. The P900 kicks it up a notch by offering a multi-PCIe solution version of the P700 with enhanced IO. The P300 model is aimed at entry level CAD and design, and comes in either a desktop case measuring 6.9” x 16.97” x 16.7” (175mm x 429mm x 424mm) or a small form factor at 4.0” x 14.8” x 13.3” (12.9l). 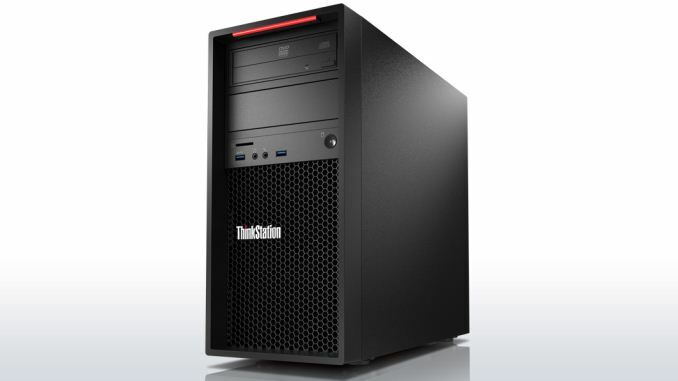 One of the goals of ThinkStation is to provide a series of units for end-users and businesses that are ISV certified and offer a series of Xeon and Professional graphics at different price points. The P300 line is aimed at the budget build, competing with the likes of Dell and HP in terms of what is usually the volume sales price points. 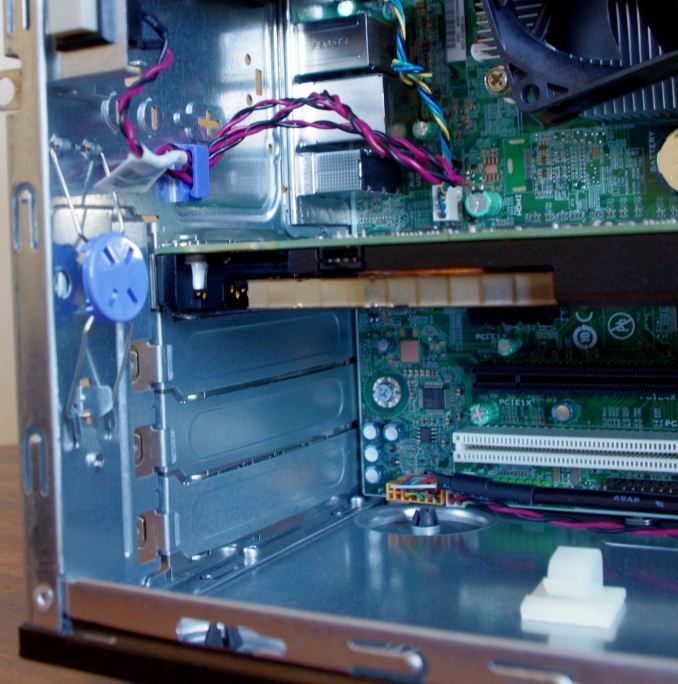 Sometimes boutique builders like to play in this space, such as DigitalStorm, iBuyPower and Puget Systems using off-the-shelf parts for individual needs. Lenovo, Dell and HP on the other hand can custom build a lot under the hood, including the case design, the power supply and the motherboard specifically for the market they are targeting. This can be a double edged sword, such as designing your own motherboard, because the main consumer motherboard manufacturers have a lot of practice in designing function to coincide with user experience. The hardware choice Lenovo sent was listed at $2135. The quad core Xeon E3-1276 v3 (3.6 GHz, turbo to 4 GHz) was paired with a single stick of 8GB DDR3 and a Seagate 1TB SSHD. The micro-ATX C226 motherboard was custom, and the Quadro K4000 represents the majority of the pure cost, retailing at $800 on its own. The system also came with a 450W 80 PLUS Platinum from FSP, a DVD multiburner, an SD card/USB 3.0 front panel and the custom case. Totaling these parts individually (replacing the case and motherboard for something similar) comes to $1720 indicating a $415 premium over a self-build, but that $415 comes with the safety of professional grade support. Three main points come to mind when looking at the specification list: DRAM, SSD and GPU. Lenovo made a big mistake in the default DRAM arrangement by only using one memory module for what should be a dual channel setup. Users are well advised to invest into a unit that has at least two modules to get the better DRAM performance out of the system as our review today will show. Having a dual channel setup can afford 30% more performance in a number of important prosumer type tasks. Also, spending $2100 on a unit without any form of SSD-only storage is pretty brutal, especially for the CAD/design market that Lenovo is targeting. Lastly the GPU, the Quadro K4000 3GB, is the workstation equivalent to the GTX 650 Ti but at a lower frequency. The only upgrade Lenovo offers is the K4200, but for an extra $175 this increases the 768 CUDA Cores to 1344, a 75% increase and almost a no-brainer. Having had our Lenovo Workstation P300 in for a number of weeks, it is clear that function is Lenovo’s main priority here. The BIOS is fairly rigid and unwieldy, with the included software at least interesting if a user wants to delve into the system. The CPU performance is the Xeon equivalent of an i7-4770, but our SPECviewPerf numbers look pretty awesome with the E5 v3 Xeon paired with the Quadro K4000. The power numbers are nice as well due to the power supply, and the downgrade to Windows 7 with included 8.1 disks should make most users feel comfortable. The motherboard is a little restrictive in terms of future upgrades as the empty SATA ports can interfere with PCIe devices, and the second full length PCIe slot is only an x1 via the chipset rather than an x8/x8 split. The 24-pin power is also split into different areas. The P300 is designed to work as purchased, rather than be significantly upgraded in the future it would seem. The Xeon E3-1276 v3 is the mid-range option for the P300, representing a $70 increase over the E3-1271 v3 (same speed, no integrated graphics) but the E3-1281 v3 is available (+100 MHz over 1276 v3) for an extra $470 which is a bit steep. Our review system came with Windows 7 Pro x64 pre-installed through downgrade rights allowing users to move back up to Windows 8 with the CDs included. Since we took delivery of our sample, the Quadro K4200 is now the default option. It used to be a $175 upgrade for +75% more CUDA cores and I listed it as an obvious upgrade when I first received the system. The main downside however is that single DRAM module being the default option for purchase. A second 8GB module is an extra $395, despite a self-build cost of $70 from Newegg for the same module. I would imagine that users with some common sense would install their own memory, although I’m sure Lenovo’s warranty system might not agree. Taking the system out of the box, the first thought that crept into my mind was one of simplicity. The design is straight edged with a matte finish, providing airflow in the front and out of the back rather than anything through the top or sides. The front of the case has a power button and a microSD/USB arrangement, along with the DVD multiburner included. The red strip at the top is a grip handle for easier movement of the system but it also adds a small visual flair. 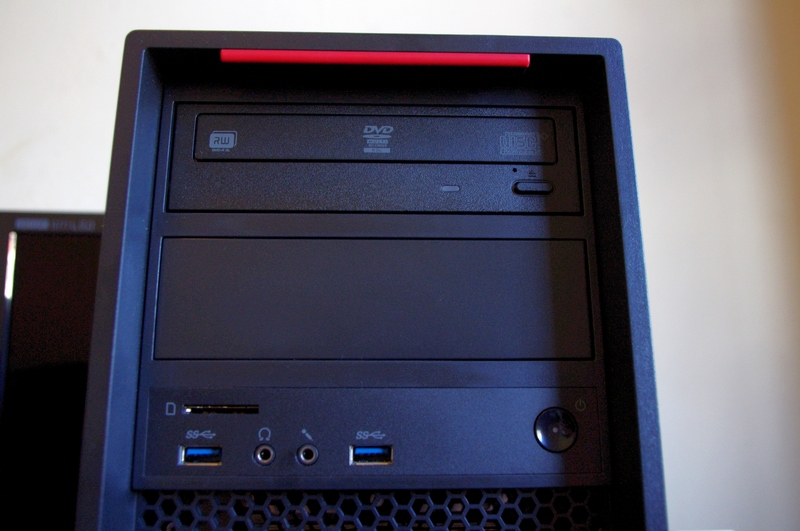 The front grille sports a ThinkStation logo along with an Intel sticker and one from Energy Star. Interesting to note that there is no indication of Quadro support here. The Quadro GPU supports DVI-Dual Link and two DisplayPort modules, whereas the rear IO panel from the motherboard also comes in with VGA and COM port connectors. Four of the systems USB 3.0 ports are here (all native), along with two USB 2.0 ports and the network interface. Due to the Realtek ALC662 audio codec used, the system is only set for 2.1 type audio outputs. Coming from the land of consumer builds, this does not look that impressive, but we have to keep in mind the intended market which does not involve side panel windows: function over form, so to speak. As Lenovo has greater control over their prosumer line, items like cable length can be configured to ideal spacing, rather than having to worry about too much cable management. Cable management still takes place however, with a single zip-tie keeping some cables at the top together and a plastic hook at the bottom which has nothing inside it. We can identify the components in this image. 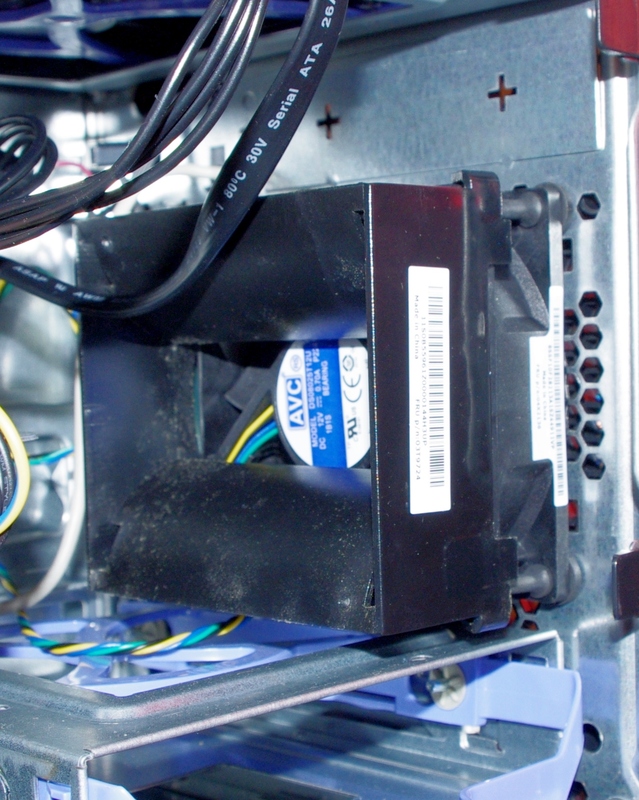 At the top is the 450W Platinum power supply from FSP, non-modular and the only spare connectors are a couple of SATA power connectors already part used for the DVD multiburner which is in the top right. On the far left is an exhaust fan connected to the motherboard. 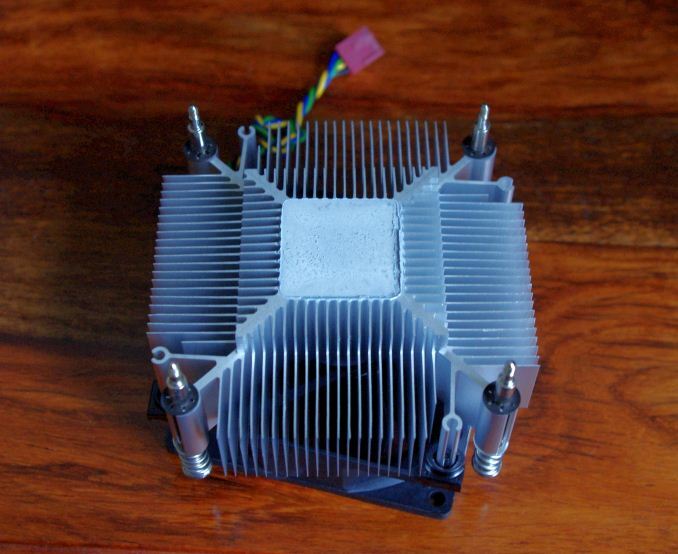 Due to the use of an 84W processor, the CPU is cooled by an active cooler, however I would point out that this is a pure aluminium cooler rather than anything involving copper. As this system cannot be overclocked, we measured peak load temperatures after five minutes of 79ºC on the CPU, which would suggest that high temperature climates combined with sustained workloads might cause some downclocking to occur. The thermal paste is perhaps over applied, but it would seem to be aluminium or silver based rather than a zinc-oxide or silicone derivative. Our single stick of DRAM in the system is a UDIMM Non-ECC Samsung DDR3-1600 11-11-11 module and some of the most basic you can buy. On the right hand side are our storage bays with the top one occupied with the Seagate 1TB SSHD and the bottom one empty for secondary storage devices. The drives use a blue tray to be inserted and removed quickly, although due to Lenovo’s cable management it is highly advised to remove the SATA/Power cables before moving a drive. Even having the system for only a couple of weeks, dust is already starting to build due to the lack of a dust filter on the front of the case. For prosumer use, where this system might be churning through workloads consistently during the weekday and perhaps overnight/weekends, the lack of a dust filter is a concern. Lenovo has also fitted the fan with a directional baffle to ensure the airflow is more directed at the GPU, although this might do more harm than good by increasing the static pressure on the fan. It would seem that the 24-pin is split into two or three different parts. A 4-pin takes care of the CPU near the rear panel, but this means that users wanting to upgrade for another GPU and PSU might need to take the dremel out or ask Lenovo for a new power supply as well. Also on the motherboard, on the bottom right, we have the SATA ports. As we can see, two are occupied in red with two more behind it in red and one in black above it. 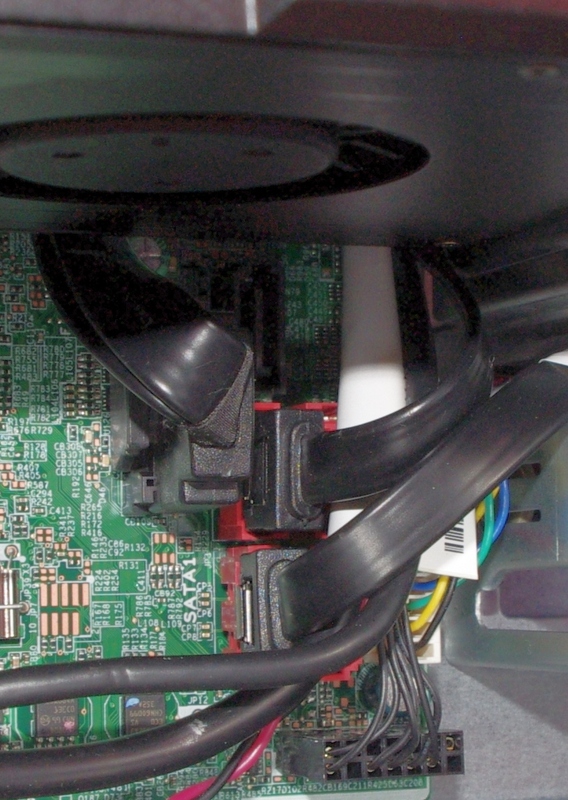 These ports pose a big problem to anyone upgrading the system – a cable in the black port means restricted airflow for the GPU, and trying to place cables into the other red ports might also be an issue with how tight the other cables are in the design. It is also worth mentioning that due to the layout of the SATA ports, the use of locking cables means that the cables to the left have to be removed before those on the right can be removed, doubling any effort to install/remove extra drives. Also, the other situation comes from adding in a secondary GPU or PCIe coprocessor. 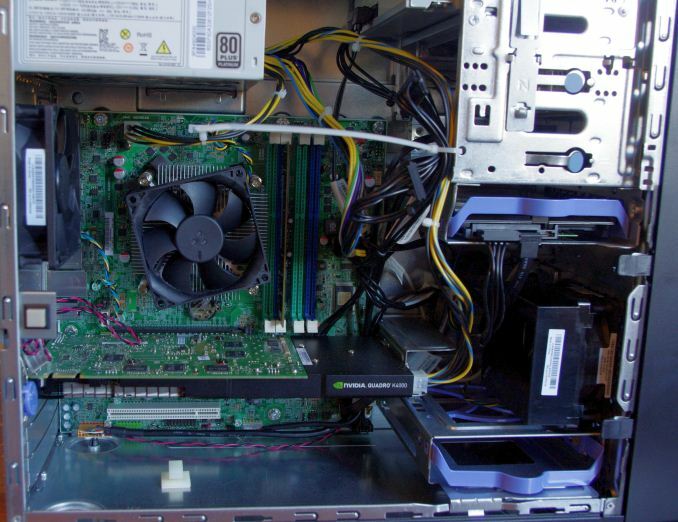 If the device is long, like the Quadro K4000, it will block SATA ports. This is why the regular motherboard manufacturers usually put SATA ports at a right angle or further up the motherboard. 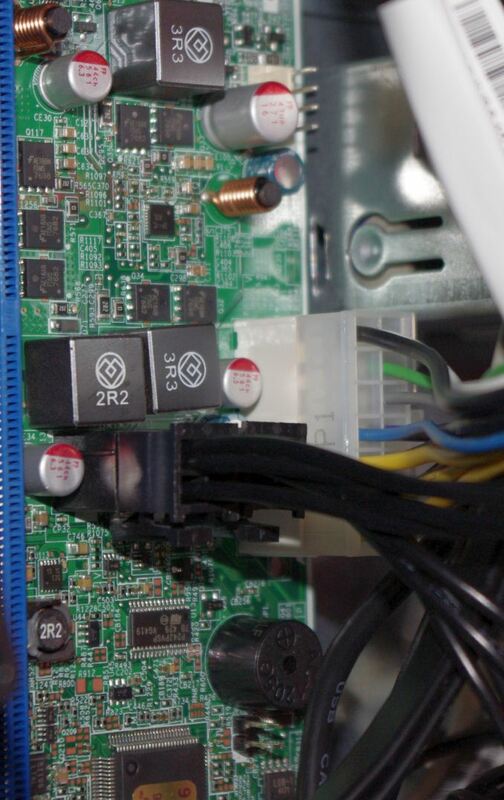 On the bottom left of the motherboard we have the other PCIe ports – a short x1, a long x1 and a PCI (from a PCIe to PCI bridge chip). Lenovo has aimed to make this case tool-less, so the PCIe slots are opened by adjusting the blue spring on the left. Above this is the case intrusion button. These are standard off-the-shelf USB parts, with the extended wrist rest on the keyboard being the nearest to an extra. 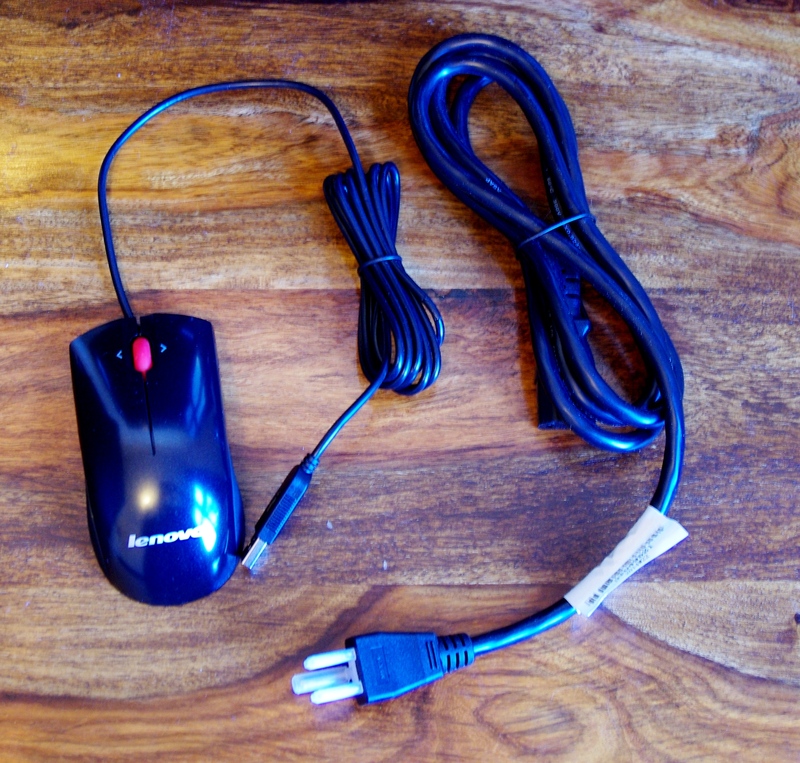 Users who need mice with additional side buttons to automate various tasks (such as switching tabs, my main use for them) will have to invest in their own. These are recovery and update media for Windows 8.1, should the system need a complete reinstall.